A cute story of some ducklings who chose to venture off to explore and not knowing that they were one step too near to the danger that lurks just around the corner. A sweet book although I don't know whether the message would be good for those parents who like to mention that everything is either good or bad with nothing in between. Perhaps in the end it will be a much better beginning book to explain why one shouldn't lean upon chance luck when one ventures out. The illustrations are beautiful and help to make the book what it is. Just a nice simple book to relax with and fall into the pictures. Very cute story. The three ducks face imminent danger time and again but escape through various lucky chances. The only problem I have with this story is that the the mother looks more like a goose than a duck. A childhood favorite that I had forgotten, serendipitously rediscovered on a shelf at the library. 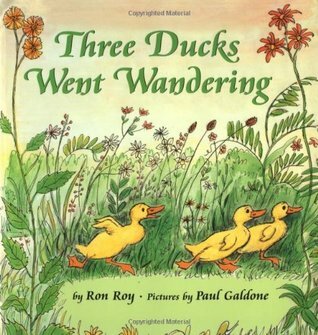 My impression now is that these ducks are particularly foolhardy, but as a kid I loved this. Excellent pictures! Reminds me of It Could've Been Worse by A.H. Benjamin, except that the ducks had a much better day than the mouse. There's an interesting subtext to both stories, though, that danger is around every corner and it's pretty much by luck that we survive. I wonder if kids ever pick up on that? three ducks have a few close calls while out for the day. galdone pictures. opportunities for children to guess what is around the corner. may be fun for readaloud despite book's smaller size. Three ducks are lucky to escape the bull, den of foxes, hawk, and snake. They are happy to sleep under her wings. Is it wrong that I think this book would have been better if the ducks were eaten in the end? Pretty good story, but the illustrations were my favorite part of the book. I just love Paul Galdone. Ron Roy Paul Galdone - Full name: Wallace Ronald RoyMost known for the children's mystery series "A-Z Mysteries" and "Calendar Mysteries"